Back in early autumn 2017, we broke ground on a unique training facility for our owners and employees – an 1100 sq. ft. bungalow to help them learn and hone the art of insulation injection. 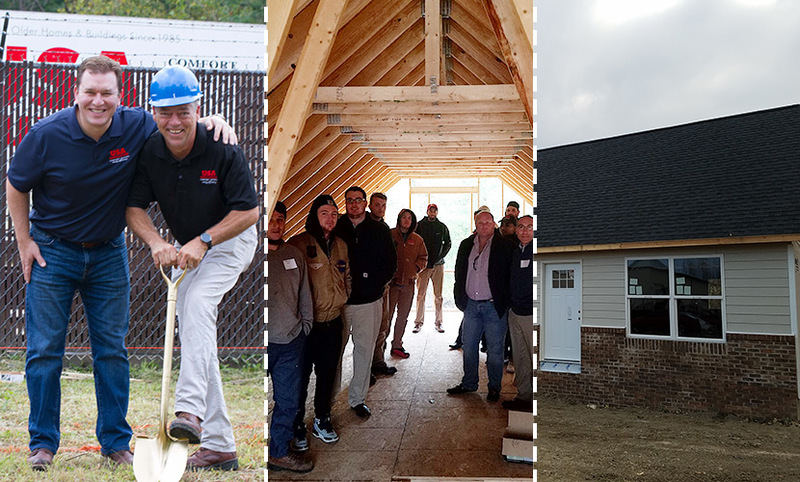 Our goal was to help improve the hands-on aspects of our training program and a house was the natural evolution of the training wall we’ve been using. The construction is nearly complete and we’re planning new training opportunities for our owners and employees. Imagine trying to “explain” to someone how to ride a unicycle. Sure, explaining is simple but putting it into practice without physically showing them is pretty challenging. The training house is like a unicycle with training wheels. We can give hands-on examples of what we can do, what we can’t do and why it’s important to get it right. The training house increases what we can demonstrate and practice at the quarterly training sessions held at our headquarters in Cleveland. This expanded training also gives our owners and installers a stronger foundation to understand updates presented during our monthly training calls. We now offer more extensive training on all kinds of home exteriors like brick, Hardie board, vinyl siding, aluminum siding and wood shake. As a result, everyone is better equipped to do their jobs and feels more confident when talking to customers. In addition to the practicalities of installing our proprietary foam, our installers need a comprehensive understanding of the factors that contribute to a well-insulated, comfortable home. But understanding building envelopes and thermal boundaries can be complicated, especially if you’re new to our industry. The training house allows us to replicate actual circumstances found in the field so everyone is prepared for any situation. For example, a recent customer had a new roof. However, the roofers installed a ridge vent but didn’t cut the roof deck open enough for the ridge vent to work correctly, which could have negatively impacted the performance of our insulation. We need to train both energy consultants and installers to identify things like this to make sure our proprietary foam insulation is as effective as possible. Our owners will benefit from a more hands-on training approach to installation, home insulation inspections and sales. The improved training provides the entire team with a better understanding of what we are trying to accomplish and most importantly, how to best serve the customer. Installers and sales reps can practice home walk-throughs. During these mock-inspections, they’ll identify problem areas, structural inefficiencies and other hidden issues we look for prior to installation. This training improves our sales reps’ confidence and helps the installers be more efficient. We want our owners and their employees to have everything they need to start and grow a viable business, including the best possible training. We constantly invest in our training, which demonstrates our commitment to Do the Right Thing, one of our Core Values. If you want to be part of a leading home insulation franchise that puts your needs first, contact us to learn more about the USA Insulation franchise opportunity.